You don’t need to get an A in Chemistry Class to understand that there are tons of kinds of chemicals in the world. Over 60 million kinds of chemicals are registered with Chemical Abstracts Service (CAS) system. From these, about 80,000 are subject to utilization by various industries. Chemicals simply co-exist with many industrial operations today. Whether in manufacturing, automotive and electronic production, pharmaceutical, medical, and chemical laboratories, and even in agricultural industries, these chemicals are essential for daily process and are proven to be beneficial for the business. It is said that ‘with great power comes great responsibility’, the saying is also true with chemicals. Handling these powerful elements certainly require a great amount of accountability. Why? Because there are certain chemicals that are corrosive or can cause visible destruction or permanent changes in human skin tissue at the site of contact. These substances can cause harm if not handled correctly. 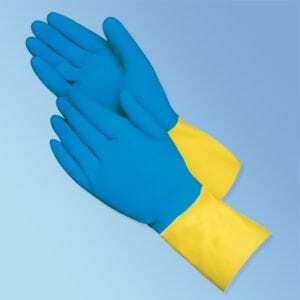 Why Use Chemical Resistant Gloves? 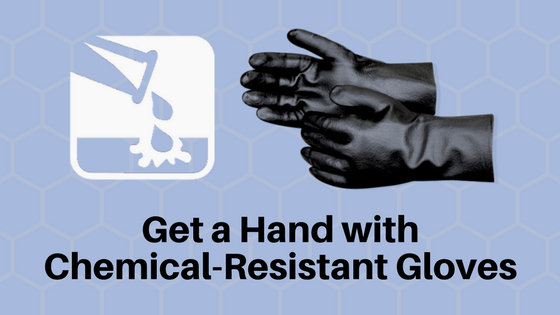 Ideal uses for chemical resistant gloves include food processing, automotive, metal fabrication, scientific research, and other areas of industry.Because you are handling powerful elements, wearing chemical-resistant gloves is one great way to demonstrate responsible chemical management and protect yourself, and your employees. Think of chemical-resistant gloves as Batman’s costume whenever you’re wearing it. Wearing protective gear helps to protect workers from injuries and helps save money and bad reports from accidents. Now that’s super! This is probably one of the first things that workers would consider as to whether or not they would wear chemical-resistant gloves. The level of comfort in wearing gloves can really affect how long one can bear to wear it. If the gloves offer poor level of comfort, workers are likely to remove them even if it means working with no protection at all. So make sure you invest in gloves that offer high levels of comfort. Besides, a ‘comfortable’ worker is more productive than one that is not. Questions that you need to ask when opting for chemical-resistant gloves are ‘Is it making handling too slippery? Is it slowing down the hands’ mobility? Does wearing it make it more or less difficult to do the job?’ Even if the gloves offer comfort but still fail to give high level of performance, it would still not be as helpful as it ought to be. Finally, consider the gloves’ level of protection when handling corrosive chemicals. The very reason why chemical handlers are required to wear chemical-resistant gloves is to protect them upon contact with the substances. This is why it is essential that you choose the kind of gloves with a high level of protection against chemical contact such as acids. Keeping your hands protected from chemical injuries and irritation means wearing the right glove for the job. We offer chemical resistant gloves that can be used for any work application, from cleanup to directly handling harsh and hazardous liquids. Keep workers’ hands safe while providing dexterity and comfort needed to improve productivity. The U.S. Bureau of Labor and Statistics (BLS) reports that hand injuries are the second most work-related injury, resulting in over a million emergency room visits in a year. Hand injuries can range from simple to very serious, taking its toll not only on a workers’ well-being but also on the company’s reputation. Skin cuts or lacerations have the highest occurrence of traumatic hand injuries in the workplace due to the use of cutting tools such as knives, razors and power tools. The damage due from a laceration can range from a simple skin cut to more serious injuries such as severed nerves, tendons and even limbs. High pressured machines and other tools used to pound, squeeze, or pulverize objects in the workplace can cause accidental crush injuries to the hands. This type of hand injury results in seriously fractured bones, which could also affect nerves, leading to temporary or permanent paralysis. Hand puncture injury can be caused by using sharp and pointed tools such as knives, wires and nails. It can cause serious damage to a nerve or bone and even cause infection if left untreated. 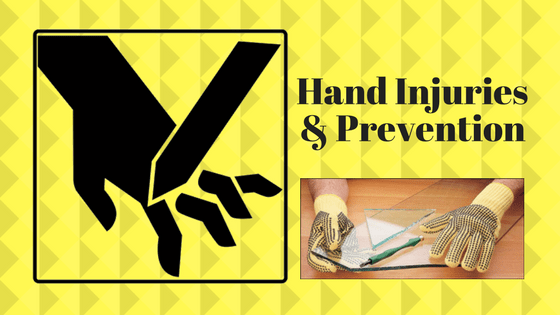 Prevent Hand Injuries: What to do? Workers who are exposed to the use of machinery and mechanisms on a daily basis are susceptible to hand injuries. This is why it is essential to minimize the occurrence or damage caused by on-the-job hazards. Wearing protective gear can lessen the risk of getting your hands injured. All you have to do is to select the proper type of gloves according to specific needs. If you are working in a construction industry, opt for gloves that are made with leathers (leather work gloves) or polymers which can protect your hands from abrasive materials such as wood or metal splinters. If you are handling chemicals, it is best to opt for chemical resistant gloves to avoid direct contact. 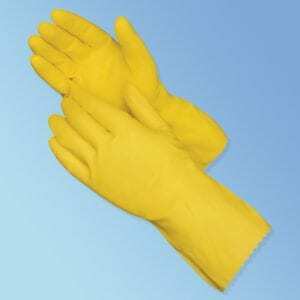 These special gloves are usually made of latex, nitrile, neoprene, polyvinyl-chloride, or other polymer materials that can resist corrosive chemical substances. 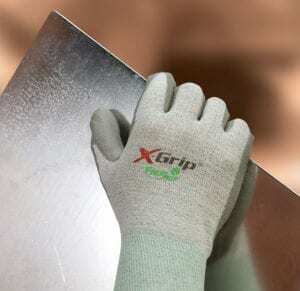 If you use knives or are concerned about lacerations using a cut-resistant glove may prevent cuts. There are different materials these gloves are made of, but the most common would use Kevlar. There are also different ratings of cut-resistant gloves. The higher the rating the more protection you are afforded. Since workplace injuries and accidents among employees can be very costly, it is crucial for employers to ensure the health and safety of their workforce. Thus, safety programs must be initiated by companies since most employees have very minimal awareness about why such training is vital, e.g. proper wear and care of hand protections. Not only will it educate employees about working safely but it will also help prevent injuries in the workplace.